I have just returned from Peru where I was climbing with an Alpine Club team in the Cordillera Blanca. 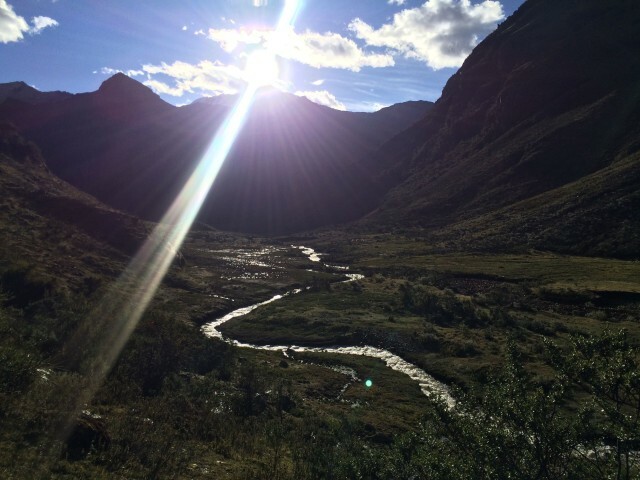 Ten of us spent two weeks based in the Quilcayhuanca valley, tackling various objectives in small teams. Between us, we climbed five different mountains in the 5000 and 6000m ranges. I summitted three peaks at almost 5500m. These were Chopiraju Oeste (5475m), Jatunmontepuncu (5421m) and Mapiraju (5424m). I am happy with this achievement. Valley in the Cordillera Blanca, where we were climbing. The setting was beautiful. I certainly liked camping out there in such a wonderful landscape, marvelling at the snowy mountains each time I got out of the tent, whether to blue skies and sunshine, frost or moonlight. The weather was mostly good and the sky was often so perfectly deep blue and clear, the rocks such dark brown and shining. The mountain sides were steep and high ridges and cliffs stood in striated bands. Small birds would hop around camp, cheeping, and the brook bubbled by in a constant background rush. I liked the peace. Small lake up towards Jatunmontepuncu, about a 2hr walk from base camp. In camp, I was reading Robert Macfarlane’s book The Wild Places. 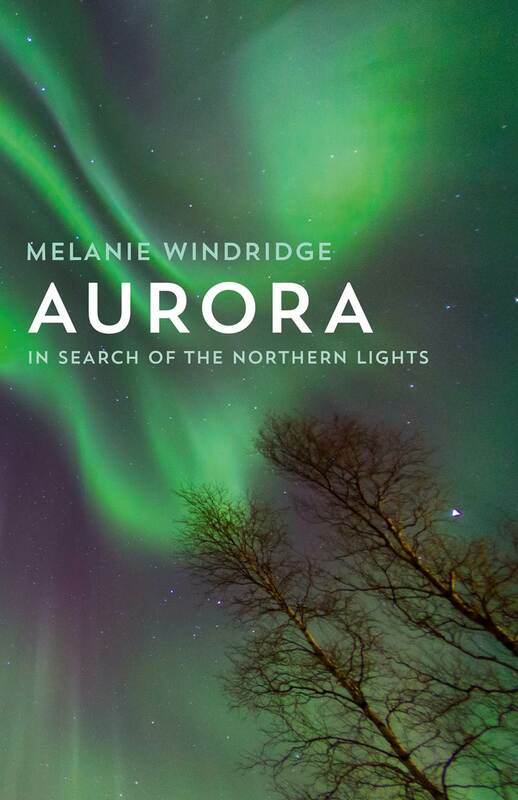 I found the contrast between his journey and mine interesting – reading about wildness and nature in the simple environments of home (Britain) while being in a foreign land exploring large mountains. Whilst we weren’t the first to climb those peaks, and odd trekkers passed through, it did feel quite exploratory climbing in Peru. The conditions we found differed fairly dramatically from the scant guidebook descriptions and often we were finding our own ways: pushing through bushes; picking through scree. Even when following the trekking paths it was easy to stray. Paths are worn grass amid grass; cairns small piles of rocks amid more rocks. All our routes were through the steep, the rugged, the unfamiliar. 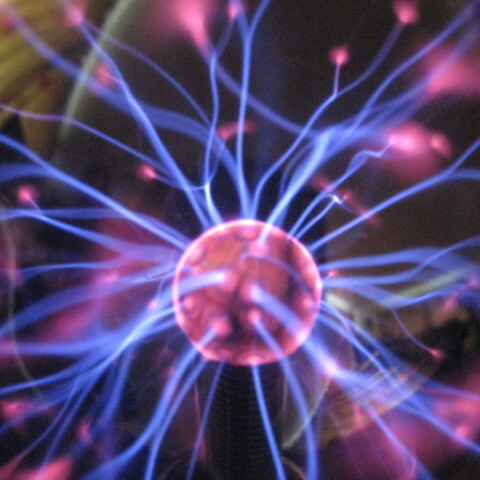 It was different, beautiful, interesting. But I enjoyed reading Macfarlane’s book alongside, having the grounding of the British countryside and the promise of simpler adventures at home. 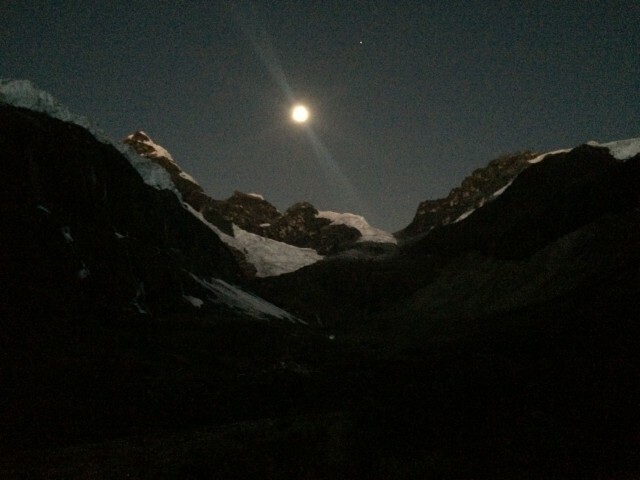 The moon shining at the head of the Cayesh Valley. 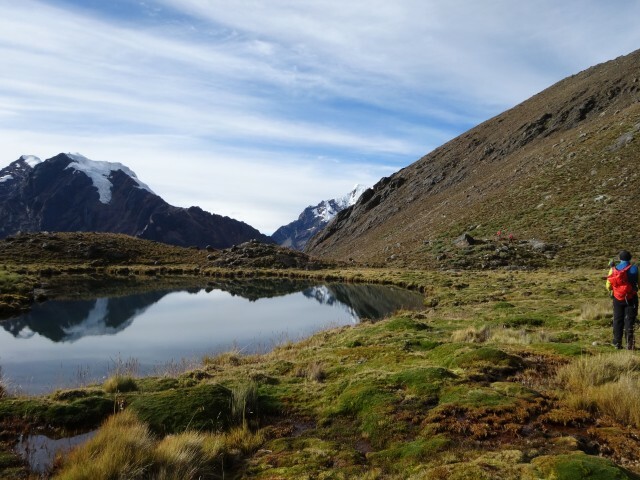 After two weeks we walked out of the valley and went back to Huaraz. A few of us moved on at this point, while the remaining seven have gone into the Ishinca Valley to attempt some more, higher peaks – perhaps even Ranrapalca, a hulking mountain that dominated many of our views. 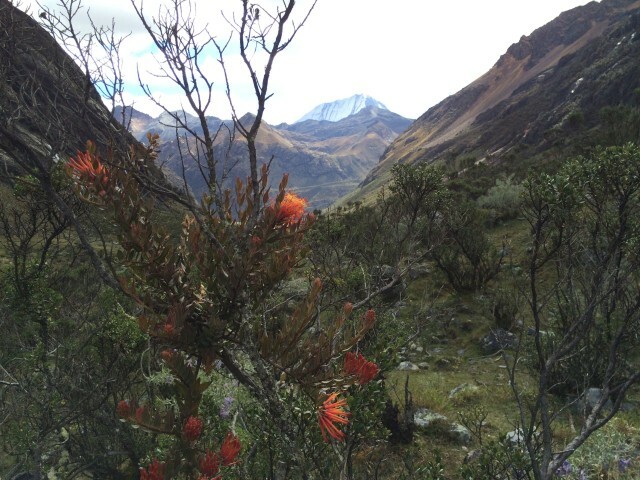 Orange flowers in the Cordillera Blanca, Peru, with Ranrapalca in the background. I’d like to thank my friend Malcolm at Marmot UK for providing me with a lovely, comfortable tent for the trip, and Derek Buckle of the Alpine Club for organising. I had a thoroughly enjoyable time. 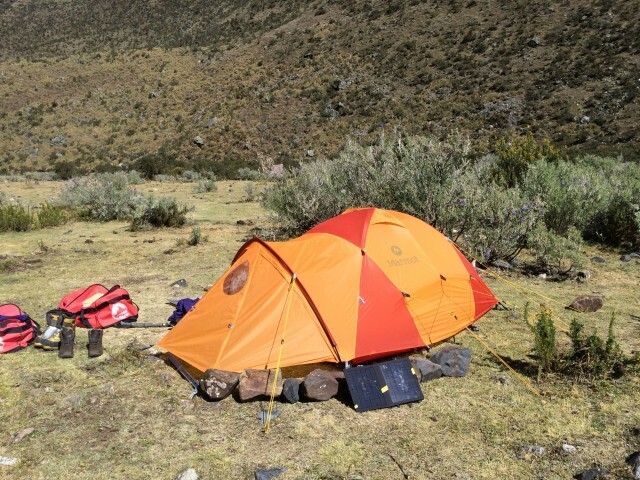 My Marmot tent in base camp. An early visitor to camp. If you want to get a feel for the peacefulness of base camp, watch the following video. Spoiler Alert! Nothing happens in this video. 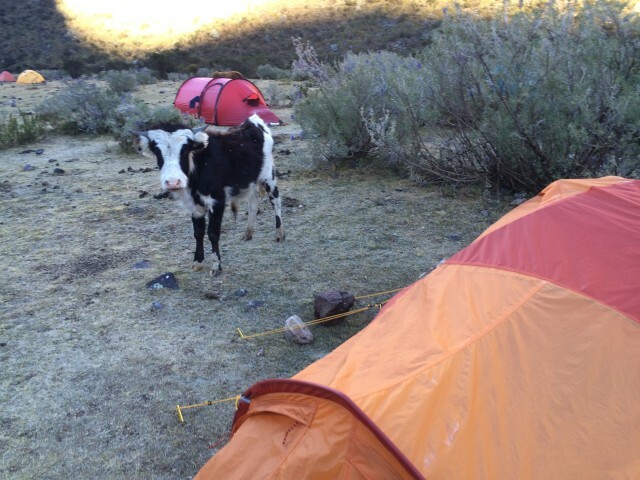 Flowers blow in the breeze, birds cheep (you’ll even see one hopping around), the tent flaps. But it gives you an idea of the tranquility of camp. And I liked it.